“I keep going back to this experience. I’ve seen him doing a lot of training because there’s a lot of training videos out there. It’s ok, it’s good publicity, which is ok, but it allows a lot of your opponents and coaches to look and find holes in you. “He’s a big puncher against super middleweights and guys who are kind of over the hill. “The first time they tried to make the fight they offered me less money than I was getting to fight a journeyman – I found that laughable. What they did is, they offered the fight knowing full well that I was never going to take it because the purse was so low. “That was there, ‘we’ve offered the fight to Buglioni and he doesn’t want it’. What they didn’t tell everyone was it was terrible money and there was nothing in my favour for that fight. There was no real interest. It was a meaningless offer. 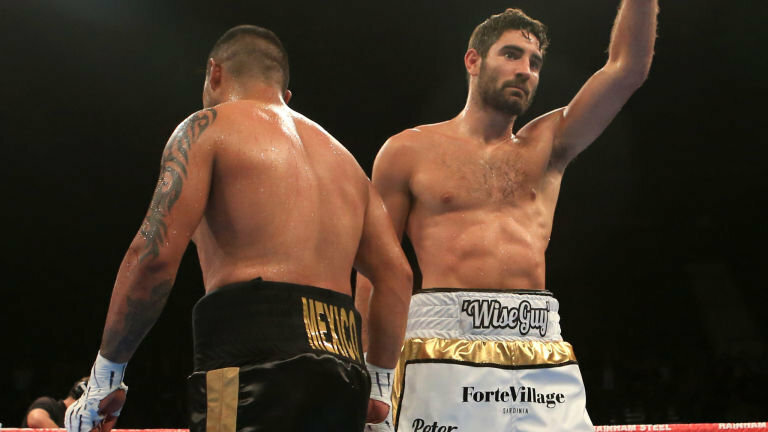 “The second time he wanted me to vacate my British title and fight on the BoxNation platform. I sat down with Frank Warren and told him it was a dream and ambition of mine to win the British title outright. He knew full well that I wouldn’t drop that British. “At the moment they’re giving me empty offers. They’re empty offers. When I win this British outright; I’m happy to drop it. I’m happy to go and fight him whether it is on BoxNation or Sky Sports – no problem at all. “I have a very strong feeling they’ll go quiet when I win this British outright. And make other excuses saying there going down a different route or there chasing world titles – they won’t want to fight me, they’ll say: ‘I’m irrelevant because I haven’t got a title’. “There’s been no avoidance and should he have taken the Burton fight he would have been my final eliminator. He would have been in line for the British and there would have been nothing I could have done about it. “Then we would have seen who wanted it because I wouldn’t have vacated that British title I would have fought him.